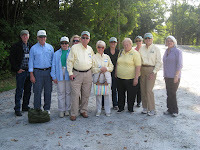 Our State Parks blog has grown out of its blogspot home and we are now being hosted by Virginia Association For Parks. So, please change your book marks and follow us at our new location, http://blog.virginiaparks.org. There is a new posting on this new blog now. Virginia State Parks located in the west and southwest of Virginia do get snow from time to time and snow activities are always fun. Trails provide the opportunity for cross country skiing and you can't beat a good hill for a run on a tobogan or sled. An escape to a state park cabin for the weekend or a drive to the Virginia State Park near you for the day is all it takes to capitalize on the latest snowfall. Reserve a cabin with as little as one day's notice by calling 800-933-7275 or on line at http://www.reserveamerica.com/campgroundDirectoryList.do?contractCode=va. Chief Ranger Kevin Kelley shows off his daring-do at Grayson Highlands State Park, Mouth of Wilson, Virginia. For those of us in the outdoor recreation arena, Richard Louv's book Last Child in The Woods was the best thing since sliced bread. A combination of factors - electronic gear, fear of stranger danger, urbanization - have created a generation of children who never experience nature and rarely even play outside. If you're reading this blog, you probably are already interested in state parks so you are probably the exception and I'm preaching to the choir. Of course, those of us in Outdoor Recreation were excited because Richard Louv's book was being looked at seriously by educators and politicos and many states and the Federal government have embarked on campaigns to do something to reconnect children to nature. 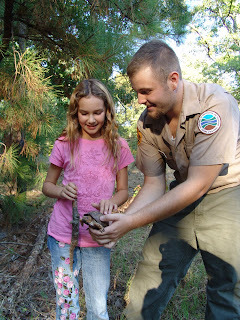 Virginia State Parks works hard to offer programming to introduce children AND adults to nature. We have a number of 101 style programs for camping, hiking, outdoor cooking, gps use at our parks as well as a full line of nature and historical programming. Check them out at http://www.dcrintra.state.va.us/dcr_forms/events/VieweventPublic.cfm. You can query by park, dates, or type of event. When the economy is tight, we all have to tighten our belts. This is no less true for state government especially when your state is having a budget crisis (which might be just about all of them by now). We took quite a hit for the FY2009 budget to do our part to balance the overall state budget, and we will likely be giving more up in FY2010. But, Virginia State Parks have been operating frugally for a long time, and we have an ace up our sleeve. The results from 2008 are in and Virginia State Parks enjoyed record volunteerism, 235,096 hours. Based on the Virginia Office of Volunteerism volunteer value of $19.72 an hour, this means volunteers contributed $4.6 million to our State Parks. Based on an average work year of 2,000 hours (after paid vacation), that's the equivalent of 117 full time employees. What do volunteers in Virginia's state parks do? They greet guests at contact stations and in visitor centers, they serve as Campground and Park Hosts (live in the park in their own camping equipment for 30-60 days in exchange for volunteer time), they conduct educational programs, they work on our trails, they monitor a variety of birds and wildlife, they assist with a variety of clean up efforts, and the list goes on. Scout troops come out to parks to volunteer in exchange for camping stays, earn merit badges or for Eagle Scout projects. Our Youth Conservation Corps program brings teens 14-17 to our parks for a three week residential volunteer program. Our Youth Service Corps beings at risk teens 14-17 to our parks for a three week non-residential volunteer program. College students give up their spring break partying to volunteer for a week in our parks. Most of our parks have Friends of groups who help with volunteer projects and the general support of our parks, including advocacy and fund raising, and we have the Virginia Association for Parks, who performs that support at the state level. There is something for everyone! With an on line volunteer database, volunteering is easy. Simply go to http://www.dcr.virginia.gov/state_parks/volnteer.shtml, fill out an on line application, and search through our variety of volunteer opportunities at the park nearest you. If you have a group that would like to volunteer, contact the park directly or email our volunteer office at vspvolunteer@dcr.virginia.gov . I spent a lot of time over the holidays playing around on the web and checking out camping resources. Invariably finding a new resource meant letting the webmaster or blogger know about Virginia State Parks or necessary corrections to our listings. It is amazing how you can lose hours and days just going from one link to another. Then there were the hours playing around on Facebook, My Space, Twitter, LinkedIn. Maybe I should have gone to my local park and hiked a trail instead of staying cooped up and tied to my laptop. I created this blog to give readers inside information about Virginia State Parks. But, I'd also like to share some of the great camping resources I found during my marathon research. First there were two blogs on camping. The first, from the folks at About.Com who apparently support many blogs on a variety of subjects: http://camping.about.com/. The most recent post on this blog talks about how economical camping is for a family vacation or activity. After a recent trip to see a movie (matinee) cost my husband and I $40 for two hours of fun, the bargain really hit home! The second blog is http://www.campingblogger.net/ . The blogger is west coast based but he has great camping tips. Check them out. For a blog on outdoor activities, you will want to check out http://www.the-outdoor-sports-advisor.com/ . I also found another camping resource called Triple Blaze, which offers information and the opportunity to review campgrounds and hiking trails, http://www.tripleblaze.com/ . As I have time, I will be providing more information on our Virginia State Parks hiking trails on this site, but all of our camprounds are listed. Another good resource is a newsletter, (you will need to email them to subscribe) The_Family_Campsite@mail.vresp.com. The most recent newsletter included articles on winter camping, winter sleeping bags, and winter preparedness. Help planning your next Virginia State Parks camping trip is only a phone call away. Just call 800-933-7275 and a reservation counselor can match up your location and desired amenities with the Virginia State Park that best meets your needs. Or, shop yourself on our website, www.VirginiaStateParks.gov. You can tell a lot about what's on everyone's mind from watching television commercials. It's like the chicken and the egg - are we thinking about healthy pursuits because all of the commercials are directed to weight loss strategies and exercise equipment/gym memberships, or is it just because another year is looming with more resolutions on eating better and exercising more? Virginia State Parks has the key for a successful New Years Resolution - get outdoors more! Visiting a Virginia State Park and enjoying nature is a fun way to begin a healthier lifestyle. Take a break from television and video games and hike a trail, watch wildlife. 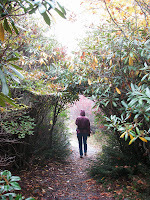 You'll find that in addition to the calories you'll burn and other direct health benefits [see details at http://www.dcr.virginia.gov/state_parks/health.shtml], "getting back to nature" has been shown to reduce stress and refresh the spirit. Another plus is that a visit to a Virginia State Park is fun for the entire family. Visit http://www.virginiastateparks.gov/ to plan your next trip now or find a program that will interest the whole family and get started on your 2009 resolutions. Okay, it's Virginia and we're not known for snow. But, when we get some, where better to explore the winter wonderland? So relax by the fire in the evening and explore nature during the day. Convenient web reservations make it possible to book a cabin with only a day's notice. 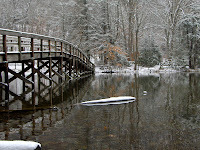 So when the weatherman calls for snow, visit http://www.virginiastateparks.gov/, find the park you want, and click on "Reserve Now" on the right. [Or click http://www.reserveamerica.com/campgroundDirectoryList.do?contractCode=va] and you'll be off to the park the next day. Two new videos showcase Natural Tunnel State Park's contribution to promoting the history and culture of southwest Virginia. The Siege at the Blockhouse features the new Wilderness Road Blockhouse at Natural Tunnel which illustrates the role it played in the 1700s during westward expansion of the nation. The park lies along the Daniel Boone Wilderness Trail driving tour; visit http://www.danielboonetrail.com/ for more information about the Daniel Boone Wilderness Trail. The Siege is held annually in May and is a living history event best portrayed by the video found here: http://www.youtube.com/watch?v=SEosdngol_w. In addition to this new history trail, the Crooked Road is Virginia's Music Heritage Trail. For more information in this heritage trail, see http://www.thecrookedroad.org/. Several of our parks feature programming inspired by this musical heritage. Grayson Highlands' Wayne Henderson Festival and Fall Festival are two well known events for mountain music. The Natural Tunnel State Park Amphitheater is also home to a number of events that feature Virginia's music heritage. Click on this video to learn about the Clinch Mountain Music Fest and some background on this rich culture: http://www.youtube.com/watch?v=CQdqzXwjPog. For more information on the Clinch Mountain Music Fest and the many music events at Natural Tunnel, see http://clinchfest.net/. It's Striper Season at Kiptopeke State Park. Check out Kayak Kevin's weekly fishing reports at: http://www.kayakkevin.com/weeklycatchwinter08.html. Even if you aren't into fishing from a kayak, this is the best time to fish from a boat or the park's pier. Concrete ships from World War II form a breaker and excellent habitat. Virginia State Parks cabins are great places to spend a romantic or family vacation. Bring family and friends around the country to a Virginia State Park family lodge (large cabin that sleeps 15-16 people). I know, you think about swimming and boating and summer activities when you think about parks but just wait until you experience a winter trip. The crowds are gone and you feel like you have the park all to yourselves. Put up a tree for Christmas, celebrate New Year's surrounded by nature, invite the family for Thanksgiving dinner (and you won't have to clean your house before or after). We can't promise snow but you never know. We have new family lodges at Bear Creek Lake, Claytor Lake, James River, Kiptopeke and Occoneechee, or perhaps you prefer a historic structure built by the Civilian Conservation Corps 70 years ago at Douthat or Hungry Mother. Or there's a river vacation home on the Potomac at Westmoreland, or a mansion on the Rappahannock River at Belle Isle State Park. Alternately, a holiday romantic getaway could also be in store for you in one of our cabins. Throw another log on the fire and cuddle up with your honey. Call 800-933-7275 for reservations. The Reservation Counselor will help find a park that will make your stay enjoyable. Keep in mind that we don't allow cabin starts actually on Thanksgiving Day, Christmas Day or New Year Day (so our cabin cleaning staff can have those days off). But your stay can include those days. We also have a two night minumum. Welcome to this new blog for insider tips about Virginia State Parks. Learn the best of what you can see and do in Virginia's beautiful and award winning state parks. This picture was taken at sunrise at the Sugarlands Overlook in Grayson Highlands State Park, Mouth of Wilson, Virginia. Learn the best of what you can see and do in Virginia's beautiful and award winning state parks.